The Seapilot screen above goes with the photo above and we had indeed just turned about 90° into this channel, which meant getting Bergström’s slippery Arcona 430 hard on the wind. The container ship Perseus J might have been an unpleasant surprise had not AIS given us lots of warning. In this case my iPad mini is online and the AIS info is coming from a Seapilot server which collects it from an extensive network of receivers belonging to the Swedish Maritime Administration and other sources. But the boat had its own AIS transponder (naturally), which is why Seapilot is showing both our GPS position (from a Bad Elf Pro) and our own AIS icon slightly astern. You can put your MMSI number into Seapilot so that your target icon is filtered off screen but Bergström finds it interesting to see what the Class B 30 second transmission rate and network latency look like. There is very little of the later. 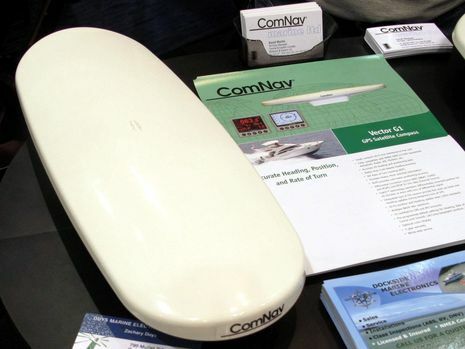 Besides for the excellent online AIS coverage, Sweden also has Net 1, a modestly priced long-range cellular broadband data system which uses the old 450mHz analog band. AIS around Sweden is fairly well covered by Marine Traffic volunteer stations (which include the True Heading office), but it’s not as good as the government coverage that’s licensed to Seapilot and other commercial users and it doesn’t show Sweden’s many live AIS weather bouys, which are represented by those circle icons on the wide area screen above. Some bouys, like the Kalmar one I’ve clicked on, have current, tide level, and visibility info besides the wind speed and direction that Seapilot can keep updating in permanent windows for the nearest bouy (as on top screen). Note also the rectangular AIS AtoN icons. Most are actual navigation aids but the ones titled “AF-2013 xxxx” show the marks for the AF Race I recently discussed and only exist in Seapilot’s server. Let’s call them Very Virtual AtoNs (VVAtoNs 😉 Aside from those, of course, a regular AIS receiver or transponder should be able to see the various AIS bouys when you’re within range, but I was sad to learn from Bergström that the NMEA 2000 AIS messages do not yet include weather bouys. On the other hand, I was delighted to hear that European regulators are pushing government agencies that collect AIS data to share it with companies like Seapilot. I wish our Department of Homeland Security got that message, as I think we’ll be discussing later this week. Seapilot is not just about AIS. 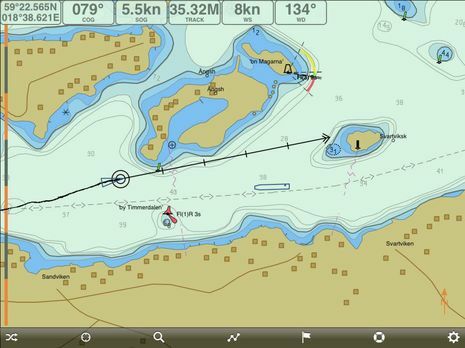 Bergström likes to think of the app as very ‘professional’ — by which he means its ECDIS-like screens and close adherence to the related S52 and S57 vector chart protocols. Personally I’m not convinced that the IMO regulations make for a better charting program than what unregulated programmers have come up with, but I become quite fond of Seapilot. The collage above shows how the Route button is context sensitive. In this case I’ve chosen a route from my list and then activated it, which triggered the RTE-DST, BRG, and XTE data windows at the top of the screen. Seapilot was also smart enough to choose the next waypoint in my direction of travel, rather than the first. What I can’t illustrate well is how easy it is to edit routes, either moving existing waypoints or creating new ones. Seapilot nicely offsets the point you’re working with slightly above your finger tip and like another recent favorite, Nobeltec TimeZero, the touch control seems just right for waypoint selection. It’s also easy to select chart data, like that speed limit seen above. There are many speed limit zones in Sweden, and expensive tickets are handed out, but several other electronic charts of the area do not show them. Another Seapilot feature I like is the Follow Lock illustrated on the Maine screen above. 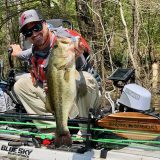 Once enabled you can finger slide the screen wherever you want as long as the red box around your boat stays on screen and your boat will stay on that part of the screen no matter where you go. It’s like the “look ahead” feature on many chart plotters but more flexible. 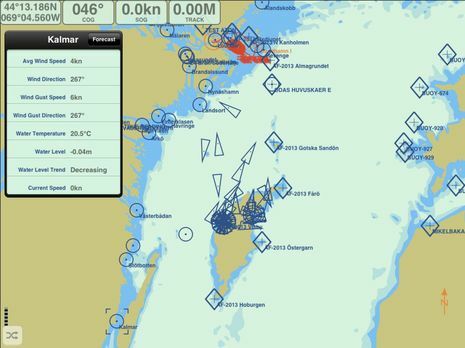 This screen also shows that Seapilot is collecting and redistributing AIS info from non-governmental sources. In fact, I can tell that the vessels shown are coming from my feed to AIS Hub because the other Marine Traffic feed on the Bay isn’t showing (I feed both, and please remember that it’s not hard to set up your marine business or near-the-water home as a volunteer receiving station, explained here). And how about that Facebook menu, which lets FB friends become Seapilot friends with near real-time tracking when both are running the app; there’s room for “social boating” in this serious app. And finally note the NMEA screen, which means that Seapilot can be set up to show both online AIS and what’s coming from your receiver or transponder. This is also possible in the latest version of Boat Beacon, and I think it will become common as online and VHF AIS learn to work together. 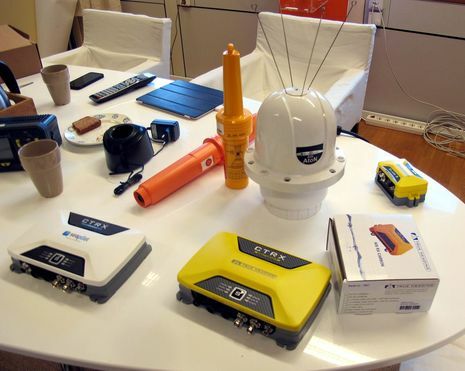 Aside from working on new professional products like that quad-antennaed Carbon AtoN sitting on the conference room table, True Heading intends to provide hardware support for the new world of online/NMEA AIS seen in apps like Seapilot. 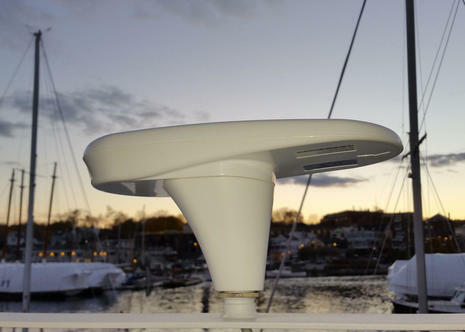 In fact, that white transponder is a Seapilot direct-to-consumers version of the company’s Graphene Class B transponders, which include NMEA 2000 output and can include antenna splitters (although, interestingly, that option is only recommended for sailboats). True Heading sources many of its modules from AIS-obsessed SRT but usually builds its own primary circuit board and often adds nicities like polarity protection. That’s why the Graphene/Seapilot chasis below is all True Heading but is ready to be fitted with a SRT Cobalt Class B module and a SRT Trident 2 antenna splitter module. But what about that WiFi spot? It’s not announced yet, and not fully developed, but eventually these transponders will also have WiFi so they can directly support Seapilot and similar apps. Håkan Lans, inventor of the STDMA protocol critical to AIS, is a Swede, and True Heading’s tagline is “We knew AIS before it was invented” because Bergström and other company principals were Navy officers who worked on the DSC silent-running minesweeper tracking that really did presage AIS in the early 90’s. The population of Sweden is less than 10 million, but they account for almost a million registered vessels and a whole lot of navigation/AIS history; we should pay attention. Hemisphere GPS compass; from ComNav, Si-Tex, & True Heading! 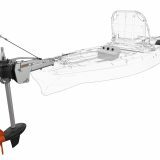 Next story Fingers on Raymarine a65, and hello a68, a75, a77 & a78! Great and informative writing, Ben! You have learned me about opportunities in my home waters I didn’t now about and I do thank you for that. I realize now that I was a bit cheap when I did not get Seapilot because I just missed the introduction price (having no iPad back then), but now I will get it for sure. Being a “returning boater” I’m slowly picking up on great navigational aids that were not around fifteen years ago. 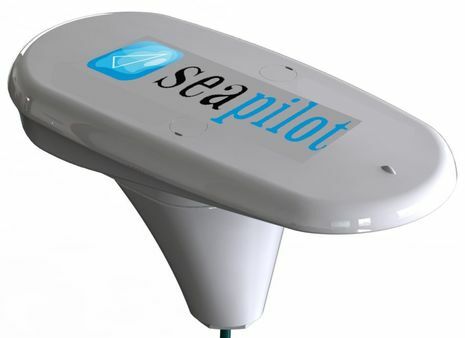 As a matter of fact I was just thinking about buying some of those Hydrographica charts as paper charts, but buying them in the Seapilot app will be easier and cost less. 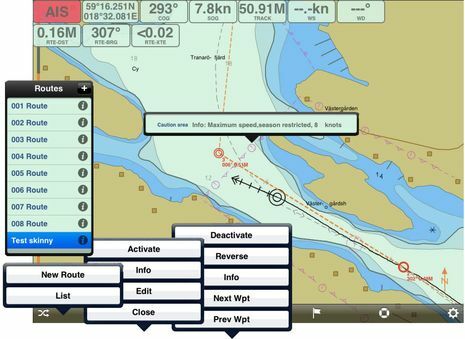 I have also read on the Hydrographica webpage that they allow Navionics and others to use their information. I have Navionics charts both in my plotter and iPad but how can I tell if the information is integrated or not? A coming comparison will be very interesting. 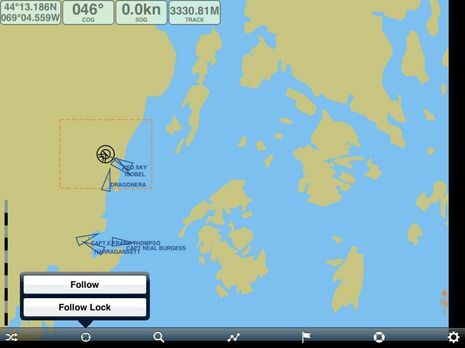 Those weather buoys must be great to have directly in the Seapilot app, even though they are available elsewhere, both as apps (for iPhone/iPad at least) and on The Swedish Maritime Administrations webpage (i.e. the Government): http://vivakarta.sjofartsverket.se/. Ben, will the AIS product double as a full feature NMEA-2000 GPS source for the boat ? 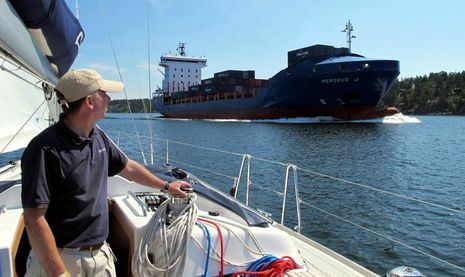 A similar question to Dan’s – Why does a class B AIS have to use its own GPS and is not allowed to use the NMEA 2000 GPS for the data it needs. Seems like I have way too many GPS’s mounted up on the bimini. There is probably a good reason, but I have never come across it in writing. 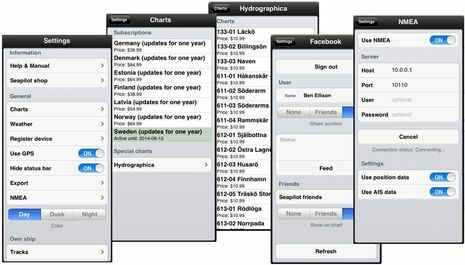 When it comes to a NMEA 2000 connected, Class B AIS we should be able to share all the network data, right? Richard, As I understand it GPS timing is critical to Class B AIS and that’s why a closely integrated GPS sensor is mandatory. I doubt that will change. But I do not know why full GPS data could not be output from a Class B transponder over NMEA 2000. I think it’s a regulatory matter having to do with the narrow bandwidth of NMEA 0183 HS, but to my knowledge Class B’s only offer the same limited GPS over N2K, though there’s much more bandwidth. Maybe Anders Bergstrom or another AIS developer can explain? Re timing, Class B AIS uses CSTDMA. It monitors its RSSI level to determine if another device is already transmitting on the network. In the presence of any Class A devices it actually synchronises to them (who are normally in turn synchronised to UTC via the GPS). In the presence of just class B’s its actually better if a Class B does not synchronise to UTC since this could result in collisions. Ben, you are right that timing is critical for AIS, but more so for SOTDMA, FATDMA and RATDMA. For a class B the timing source does not need to be a GPS source. The requirement for having an integrated GPS RX I think is more driven by the intent of Class B devices being a fully autonomous safety device i.e. plug and play. Particularly since Class B is focused on recreational and light commercial with the vast majority being retro fits. 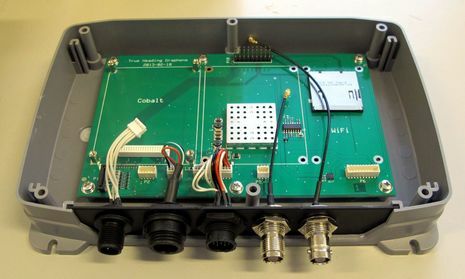 The user only needs connect power, a VHF and a GPS antenna and configure the MMSI. The rest is taken care of. Full GPS data could be output on N2K by an AIS Transponder. Is there value in doing so compared to just outputting the rapid PGNs? I think a Class B that output all GPS info over NMEA 2000 would be greatly appreciated because most plotters will not accept the current rapid PGNs as a valid GPS. I’m not sure what they want — HDOP values, individual satellite positions, it may vary — but so far I’ve not seen a single MFD that sees an N2K transponder as a GPS source. Maybe that will be different when I get your Vesper WatchMate Vision running tomorrow? won’t be seen by MFD’s? Carl: I feel like I missed something. I got the understanding why an AIS product won’t use an external GPS source, but don’t understand why the GPS source included with an AIS product can not contribute all the necessary PGN’s to the N2K bus to be a GPS source (so that no other is needed on a boat). Any chance of these AIS transceivers coming down in price more ? Seems it costs at least 1100 US$ to outfit a boat with AIS (hardware). Seems pricey, especially when I See how little is in that box. What makes it so pricey ? I do like NMEA 2K offering a bus for all brands to use. What I don’t get is why they suggest to use NMEA 0183 over NMEA 2K to avoid overflowing the network. Isn’t NMEA 2K supposed to be able to communicate up to 1Mbps ? And why oh why didn’t they just go with UDP /ethernet that is so common and cheaply usedin computer networks. Even at 100mbps (which is outdated ) It would have been bullet proof for many years to come in marine applications. Sailing in the area just visited by Ben, i.e. the archipelago of east Sweden, I think it becomes more and more obvious that there are som serious enhancements needed by MFD manufacturers concerning presentation of AIS targets. I use the AIS information to keep away from big ship traffic and then i need to know where they are approx 30 minutes in advance. Some way (colors?) of presenting Class A and B transponder symbols differently. Class B targets are not interesting inshore, since the area is full of yachts anyway. In addition I think much more refined sorting and filtering citeria of target lists, are needed. Ren, did you read that on the True Heading site? Anders Bergström mentioned that to me and I was surprised as I’ve not heard it before and it’s certainly not my experience. Gizmo’s fairly extensive N2K network had no trouble when over 120 AIS targets were running around the system in New York Harbor. Incidentally, Bergström is also a Vesper fan (and distributor) and plans to add similar AIS plotting features to Seapilot. Dan, I agree this should be the status quo, there is no technical reason for this not to be done. It is also probably the intent of most AIS transponder manufacturers that their devices are used in this way. Ben, it is interesting that the rapids are not used by some MFDs as a position source. I also have to wonder how many MFDs implement private PGNs to do this, or have done it this way in older firmware versions. It sounds like the consensus is AIS transponders supporting PGNs 129029, 129540, 129025, and 129026 would be a step in the right direction re distributing position data. Adding the “long” PGNs 129029 (GNSS position data) and now we’re at it PGN 129540 (GNSS Sats in view) besides the “rapid” PGNs 129025 (Position, rapid update) and 129026 (COG & SOG, rapid update) for location precision is exactly what I asked Navico to add when I reported my field test information on the AIS 400. 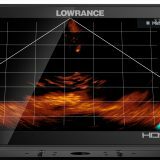 Given that that is an SRT device as well I hope that this information has reached SRT by now and that we will get such PGNs in a future update. Having redundant GPSs, or not having to buy a second one, is why we users want this. On N2K loading: I sometimes get 500+ targets and I don’t think this is even close to swamping the network. Since the native signalling rate is less than 38400 bps a 250.000 bps network can easily carry this, even if there is some N2K overhead. Besides, the AIS PGNs are only priority 4, so any data with higher priority will not be impacted. Next time I am in a high AIS density environment I will check my network loading factor! Thanks, Kees! We’re getting side-tracked but this is an important side track. It would be great if Class B AIS transponders could serve as primary or backup N2K GPS sources, and it sounds like Carl, who works at Vesper, and SRT product manager Matt Clark, who is monitoring this entry, agree that neither regulations nor technical issues are in the way. What seems to be happening is that the transponder engineers don’t realize how much GPS data an MFD requires to consider a source valid. And I don’t believe it’s a matter of private messages. Most all the MFDs on Gizmo can see all the other manufacturer’s N2K GPS output, even when the GPS is internal to an MFD (though Garmin MFDs tend to be fussier). I’ll try to do more analysis. The em-trak (B100) unit can output the GPS and AIS data over the serial and USB port (NMEA0183). I’m using this to feed a PC with OpenCPN. Works perfectly. Thanks, Hubert. Most PC nav programs are much more forgiving than MFDs about what GPS info they will accept as valid. Coastal Explorer will also use the GPS output of most any AIS transponder, for instance. I wouldn’t call it perfect, though, as it doesn’t include individual satellites in use and other accuracy info and it won’t support the higher refresh rates seen from many current GPS receivers. Apparently there’s not enough bandwidth over 38,400 NMEA 0183 to fully support GPS and leave enough room for busy AIS areas, but there is room over NMEA 2000.
yes, the nav applications have to be more forgiving, as the environment they will find is much more diverse with very different equipment and exotic set-ups. A question: for navigation purposes, where do you need to know if you have 5, 8 or 12 sats in view? (BTW. : depending on the GPS/AIS used you will have this data as well, the B100 does not send it though). What is the positioning error you are expecting, taking into account that charts can be quite off as well? In the clear sky environment I would expect today maximal GPS errors in the few meters range, probably better, and as I will not make automatic docking trials nor will I pass others at this distance (without looking out of the window) neither, this is ok for me. In relation to bandwidth problems at 38400 baud and AIS/GPS I have not heard reports up to now about it. For sure one can saturate the NMEA0183 connection squeezing more, especially faster data sources onto it. And of course N2K provides a much broader com channel and will allow a lot more fast updated data. Not to speak about the easier interfacing. But in the strict context of navigation the 38400 baud output just works correctly. Interesting! 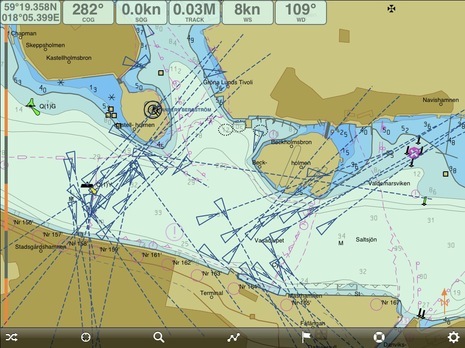 Raymarine has acquired the SeaPilot charting app, which has evolved nicely over the years.